Do you remember being in elementary school and it was time to pick teams? Kids would jump around, hands in the air, voices screaming “pick me, pick me”! We see versions of this today on television. The Price is Right show scans the audience showing people dressed in various attire to draw attention to the producers to perhaps get an edge on being picked to compete to win prizes. When I was younger there was a show on TV called, Let’s Make A Deal. The crazier people dressed, the more likely they were to be picked to make a deal with Monte Hall. Today’s version of a “Pick Me” television show comes in the form of reality shows. We see The Bachelor and The Bachelorette shows where people do all kinds of things to get the star of the show to pick them. The show, Survivor, includes contestants forming “pick me” alliances with other contestants in an attempt to be the winner. The things people do to be picked to be on a winning team! The devil and his schemes are no different than a crazy television show. He dangles shiny things in our faces to get our attention. He disguises choices to look better on the surface than they really are. He does anything he can to get our attention and get us to pick him and his schemes over Christ and His godly ways. 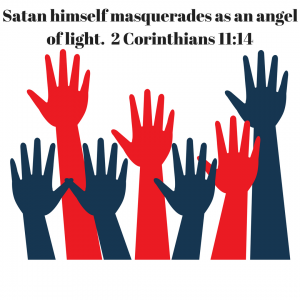 Let’s be very cautious as we go about our day today not to be distracted by the devil-in-disguise schemes and choices. Pray before you make a decision and ask for God to lead you to make good choices. The devil is jumping up and down screaming “pick me, pick me” while Jesus is standing in the corner, arms open wide with a loving smile on his face, begging you to pick Him. The difference is the end prize. One choice leads to peace and the other leads to destruction. May your day be filled with all good picks! This entry was posted in devotional, inspirational, motivational, spiritual on September 28, 2017 by Deanna Young.